Beata Tsosie Peña is an indigenous woman of mixed ancestry from Santa Clara Pueblo and El Rito, New Mexico. The calm with which she speaks contrasts with the harsh reality she faces in her community. As she herself says, since the 1940s, the United States government has occupied an important part of the Tewa people’s sacred land, located near the Rio Grande river in Nuevo México, to conduct nuclear, biological, chemical and weapons research, and produce plutonium pits to maintain the nuclear weapons stockpile. Los Álamos National Laboratory is a federal laboratory that belongs to the US Department of Energy (DOE) and is managed by the University of California. One of the largest multidisciplinary scientific institutions in the country, it produces parts for nuclear weapons. “We hear the explosions because they do open air tests and disposals of high explosives, which contaminate the air, soil and the water we use for agriculture”, she states. The nuclear activity in Los Álamos directly affects the communities living there, as they live on agriculture and depend on clean water, air and land for their survival. As she states, “we have lived here for thousands of years. Our role is to be the protectors of this place – of the land, the water, the animals and all of nature”. It is a sacred place. The rituals and ceremonies of these communities also depend on the water. In the understanding of the indigenous peoples, contamination and the degradation of land for the sake of the arms race affects life as a whole. 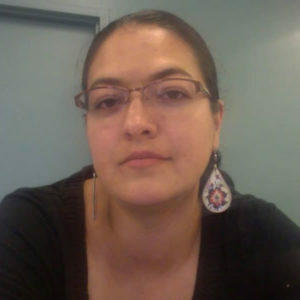 This is what Beata calls “environmental racism”: when the negative impacts of large-scale economic or war (in this specific case) activities affect the environment of particularly vulnerable groups living in certain geographical locations, such as the communities of poor and coloured people in the United States. For Beata, these communities are experiencing new processes of colonisation. “We were colonised and we continue to be colonised over and over”. It is a form of attempted genocide of the indigenous people and the destruction of the history they share with other communities. Faced with this reality, Beata joined TEWA Women United (TWU) – or “wi don gi mu” in Tewa – which means, “We are one in mind, heart, and spirit”. TWU is an inter-tribal collective that offers a safe space for the empowerment of indigenous women who are seeking justice for their communities and families. Beata began working with a focus group on Los Álamos and is now the coordinator of one of the four programmes of TWU: the environmental health and justice programme. The objective of this programme is to increase local awareness on environmental issues; support the creation of networks of people affected by industrial pollution and, primarily, promotes commitment and community participation. The environmental justice programme builds strong local and international activism, which seeks to stop nuclear proliferation and defend, as they put it, “human rights and the rights of Mother Earth”.11. See http://tewawomenunited.org/programs/environmental-justice-program/. “Our indigenous vision is to put an end to all kinds of violence against native women, girls and Mother Earth”, Beata affirms as she explains the relationship between environmental justice and reproductive justice. The relationship between care for the Earth and care and respect for women’s bodies is central for TWU. Therefore, one of their concerns is to educate community while seeking to strengthen their voice and leadership in the community, and to raise their awareness and empower them on food and seed sovereignty and sexual and reproductive health. This is part of the educational work that Beata carries out directly in her community. Beata draws from the philosophy of “women are the first environment” – a famous quote by Katsi Cook (a Mohawk midwife and elder) that highlights the vital connection between the Earth and women’s potential as generators of life. Fighting for environmental justice with TWU consists mainly of educating youth and recognising the ancestral wisdom of women elders on the defence of native sovereignty, caring for ecosystems, intergenerational wisdom and a Tewa way of knowing and being. TWU also joins forces with other groups in the region that are resisting the negative impacts of the activities of Los Álamos National Laboratory (LANL). Beata specifically mentions two of them: the first is Las Mujeres Hablan (The Women Speak), which is a women led network in northern New Mexico, a group of local activists and NGO’s who are defending their land against the nuclear arms industry while working towards cultural preservation. And the other group is Communities for Clean Water (CCW): a coalition that works to guarantee that the water affected by toxic waste is safe for consumption, agriculture and the sacred ceremonies of the tribal communities near the Río Grande river basin. CCW is the only local coalition that is monitoring toxic waste and pushing for changes to public policy. These joint efforts strengthen resistance to the constant threats the people located in “sacrifice zones” face in the United States. Sacrifice zones are places where highly polluting industries and the deposits of toxic waste are concentrated, which causes serious human and environmental impacts. It is no coincidence that these zones are inhabited by vulnerable communities marked by social and racial inequality. The final goal of these coalitions is to raise the voice of these communities and promote collective action to stop the contamination of their sacred land. But as Beata states, this struggle is very difficult because the state really does not listen and because the work to defend clean water and environment comes up directly against strict national security policies and the economic interests of large corporations. However, Beata’s commitment is to life as a whole, as conceived in her tradition. This is why, when questioned on the role of religion in environmental justice work, she responded, “In my work, I do not separate the struggle from my spirituality” and because “spiritual and mental impacts caused by the abuses of the companies that produce arms exist”. The contamination of the communities’ water and sacred land is a direct attack on their possibility to survive, including their spirituality – that is, everything they believe in. “We are truly holistic in our spirituality”, she affirms. Separation does not exist. Violence against Earth is violence against people’s bodies. “We can only do this work with the strength of our spirit-rooted loving energy, with my connection to Earth and to the mothers of the corn”. This is why working with plants, health and the wisdom of women elders are so important, as they are a way of using energy to do good. Putting an end to the violent use of the internal energy of Mother Earth is one way of challenging the culture of violence, resisting the glorification of war, inherited from colonialism, and looking for ways to create a culture of peace, reconciliation and healing for Mother Earth.